The Scottish Gamekeepers Association (SGA) has said its members have the knowledge to boost efforts to conserve golden eagles. The association acknowledged persecution was an issue and it had recently expelled four members for wildlife offences. But it said conservation work by many grouse managers was being "overlooked". 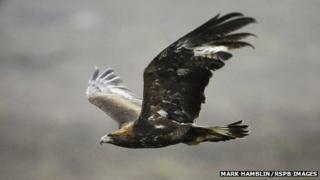 It said a survey of keeper-managed moors in east and central Highlands had identified at least 55 eagle nests. On the west, where the SGA said there was little interest in grouse shooting, eagle numbers had been constrained by a lack of small prey, reduced deer populations and extensive forestry. Chairman Alex Hogg said gamekeepers had the know-how to aid golden eagle conservation work. He said: "The conservation work done by many of our members in this area is forgotten because of the actions of a few." Mr Hogg said steps have been taken to tackle persecution. He added: "As well as educating, we have expelled members found to commit wrong-doing and where conflicts arise, as they will, we advocate lawful solutions. "That said, many responsible game managers have had eagles on their land for many, many years now. They are willing to assist wider eagle conservation and have skills to be an asset." Earlier this week, the Scottish government announced a series of actions aimed at protecting birds of prey. Launching the initiative, Environment Minister Paul Wheelhouse condemned the "outdated, barbaric and criminal practices" which he said had put wildlife at risk. Lord Advocate Frank Mulholland has ordered prosecutors in the wildlife and environmental crime unit to work with Police Scotland to make sure all investigative means possible are being used. Scottish Natural Heritage has been asked to examine if general licences for trapping and shooting wild birds could be restricted on land where there is good reason to believe crimes have taken place. And a special group will be established to review how wildlife crimes are treated within the legal system. It will examine whether the penalties imposed are tough enough to protect species such as the golden eagle, hen harriers and red kites. RSPB Scotland said it welcomed responsible game management. Director Stuart Housden added: "However, as the SGA acknowledges and the Golden Eagle Conservation Framework - published in 2008 by Scottish Natural Heritage - shows, illegal killing remains a very significant threat to golden eagle populations in Scotland. "Many of the biggest problems in recent years have occurred on areas managed by gamekeepers as driven grouse moors. "The ongoing persecution of birds of prey remains a stain on the worldwide reputation of Scotland."